Dunning Golf makes fantastic apparel items, from underwear to pants, shirts, and outerwear. The line is some of the best of the best in golf apparel. I’m thrilled to have the opportunity to review Dunning’s offerings and let my readers know about this wonderful apparel company. 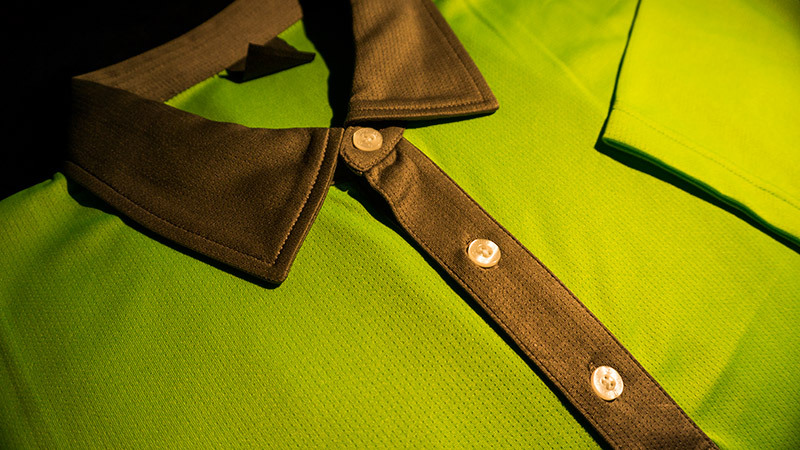 Today’s piece is the Dunning Solid Mesh Contrast Collar Signal Golf Polo. Yes, it would be better with a longer name, but we can only go with what they give us. This polo is a high high contrast green and gray. It’s hard to describe the color of green but the best way I can describe it is vibrant or perhaps electric. Despite how vibrant the green is, it is still very classy and not too over-the-top. Not sure how they manage that but they do. When wearing this polo with a pair of gray Dunning shorts, the color scheme is tremendous. In fact, it made me want to redesign my website with the same color base? What other golf blogger has an outfit that matches his/her website?! Seriously. The fabric in this polo is 100% polyester. I’m a big fan of “polys” and not so much a fan of cotton anymore. Polys are so much easier to care for, don’t wrinkle, don’t shrink. They last forever and are very strong and durable. Despite being a poly, the polo is as comfortable as any golf shirt I’ve worn. The flexibility and fit of this great polo lend themselves to a free and unrestricted golf swing. The mesh fabric helps keep the player cool and wicks moisture away. This Dunning polo would make a fantastic golf Father’s Day gift.